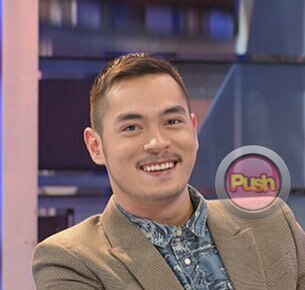 While he didn’t flatly confess to courting his “Maria Mercedes” co-star Jessy Mendiola, Kapamilya actor Jake Cuenca’s recent remarks about her has stirred conclusions that he is having a silent competition with singer Sam Milby, who admitted recently on national TV that he was wooing the young actress. Presuppositions about their competition began after the Star Magic Ball where Jake was reportedly seen giving a sharp eye to Sam while speaking with Jessy. The issue further flamed with Jake vaguely commenting “May the best man win” during the recently-concluded press conference for their upcoming soap. While he might have come off as a little too proud on his previous interview, Jake reiterated that he never really meant to offend Sam with his comments. “No offense meant to Sam, he’s my friend. But iba lang talaga ako manligaw… When it comes to my personal life, I want to keep that to myself. I like building a world na kaming dalawa lang nung nililigawan ko or nung girlfriend ko,” Jake said. As to whether he’s planning to really pursue the actress, he didn’t give a response but he however said that his confidence plummets to an all-time low whenever he’s around her. “Sobrang confident ko bilang lalaki pero pagdating kay Jessy, natotorpe talaga ako. For the first time sa buong buhay ko na matorpe, ngayon pa,” he shared. Jake’s last rumored girlfriend was actress Lovi Poe.